I found this Nessie report while I was doing my usual rounds of the Internet a few weeks back. It is taken from the Highland News dated 28th August 1993. It is a known account and Gary Campbell has the sighting listed on his sightings register site for the August 10th. Steve Feltham, stationed at Dores Bay, has known Roland O'Brien for 25 years and I asked for his opinion of this report. He certainly regards this as a very good sighting by a local fisherman who has fished on the shore extensively. And I would agree with him. I have said it before, but I always give more credence to people who have a long track record of watching the loch (for whatever reason). They are the ones who are more than familiar with the moods of the loch and are far less likely to be deceived than someone just off a tourist bus who has never lived near a body of water in their lives. The original clipping is below with the text of the report further below for ease of reading. A SCANIPORT man has broken his silence on a rare double sighting of the Loch Ness Monster. He is 41-year-old forestry and landscape contractor Roland O'Brien of Balmore Farm, Scaniport. The memorable night Nessie gave him an encore was Tuesday August 10 but he said that, like most country folk, he's been reluctant to talk about it. He told the Highland News he was waiting for a fishing mate at the 30mph limit sign on the Foyers side of Dores when he had the biggest shock of his life. "I had baited my rod and had been fishing for 10 minutes. and there were quite a few fish rising," he said. "Something caught the corner of my eye, but I didn't pay it too much attention to start with. It was its strange behaviour that made me look again. I saw a large dark hump about 500 yards out from the shore and heading toward the buoy in Dores Bay. From the size of the buoy, I would estimate that what I saw was between eight and 10 feet long." Roland revealed. "It was about four feet out of the water at its highest point, making it larger than the buoy. It moved rapidly for about five minutes and seemed to be making lots of splashing in front of it. It came to a stop, then started again. It stopped again, then started off again a third time." Roland said. "About 50 metres from the buoy it stopped. appeared to turn round, then headed back. Then it sank on the spot without a trace." Roland said he did not know what to do, because he was simply shocked rigid by his experience. But he was to receive a second helping! I'd been watching for about four minutes before the creature went down," he said. "then, about a minute later, up she came again! The second time, there was no great commotion. It was moving reasonably slowly back towards me in about a 60-degree angle. The shape was the same as before. It looked fairly bulky. Swimming back from the buoy, it came to about 350 yards from me. I watched it again for about five minutes. About halfway into the second sighting, there was a big splash beside the hump," Roland said. "The splashing continued for a couple of minutes, then it sank again, and again it left no trace." Again he was not frightened, just shocked rigid, not knowing what to do. Altogether, he had had a grandstand view of Nessie for something like 10 minutes in excellent visibility with the loch calm. "I have been watching Loch Ness for something like 10 years," Roland said, "I had seen something twice before, but never anything like this. Any talk of logs, dogs, cattle or deer swimming is nonsense. What I saw was large and capable of going from standstill to extremely fast in seconds. Not only that, but when it turned, I seemed to see something light. There seemed to be a lighter underside to the creature." 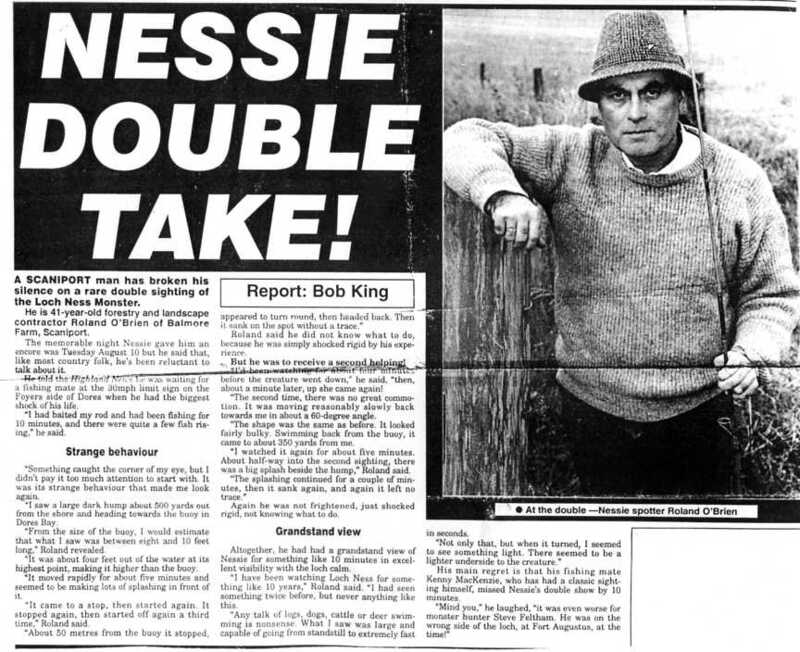 His main regret is that his fishing mate Kenny MacKenzie, who has had a classic sighting himself, missed Nessie's double show by 10 minutes. "Mind you" he laughed, "it was even worse for monster hunter Steve Feltham. He was on the wrong side of the loch, at Fort Augustus, at the time!" So ends the report and consider that statement, "any talk of logs, dogs, cattle or deer swimming is nonsense". I like that. This man is a "knower" and not just a "believer". I don't actually know Mr. O'Brien's view on his sighting 23 years on, but I suspect he hasn't decided on logs, dogs or ungulates. Or perhaps, as some sceptics like to aver, this is another of those local "jokers" who love to pull our legs and have a laugh behind our backs. I think I will reserve judgement on who is actually joking here.